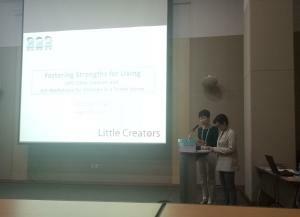 On August 11, 2017, Kumi Shimokura who is the Visual Arts Program Manager of Little Creators together with Kyoko Hasegawa gave a presentation during the 35th World Congress of the International Society for Education Through Art (InSEA) at Daegu, Korea. （http://www.insea2017.org/index.php)　Kumi and Kyoko introduce the situation of needy children in Japan and our visual art workshop at Misono Kokomo-no-Ie foster homes. Please check the following abstrat of our presentation "Fostering Strengths for Living". Symposium on "Future Ready Asia"
◆Free Admission, but please register first via fax or email. Many governmental and non-governmental organizations are actively working to support the socially vulnerable, including the disabled and those who are disadvantaged in less-fortunate circumstances. Such entities provide educational opportunities, advocate human rights, improve infrastructure and living conditions, while assisting medical needs and creating the employment. However, not much is reported on the outcome. Rarely do we have updates on whether the vulnerable were able to participate in the society or if any economic disparity was mitigated. This insufficiency is apparent even in developed countries like Japan, and more so in developing countries. How can we support and empower these NGO and the vulnerable specifically in Asia? How can we help the vulnerable to actually be inclusive participants of the society? How should we support them find income stream? At this symposium, we would like to discuss the role of NGO from various points of view. "Society Aiming for Social Inclusion - Broad-minded Society to Foster Its Diversity"
"Children's Right in Asia - Especially the Right to Participate Fully in Family, Culture and Social Life"
"Financial Support for the Vulnerable"
"Future Ready Asia - New Vulnerable-friendly Platform in Asia"
There will be the ChildAid Asia Incubation Programme "Friendship Concert" on January 12, 2015 (holiday) as a joint concert by young musicians from Asian countries. All the participants will spend some time together, collaborate and rehearse for a few days prior to the concert. ◎ you will be able to collaborate with young talented musicians from Asian countries. ◎ you will have a chance to perform in both "Friendship Concert" (January 12,2015) and "ChildAid Asia 2016" concert. ◎ you may have chances to participate in international cultural exchange programmes and music concerts in other countries in Asia in 2015. The result will be announced by the end of July. The actual audition will be on August 8. The auditionees have to be under 19 years old on the audition day, and also to live in Japan, and are requested to attend the rehearsals from January 8 to 11 (if you have classes on the 8th and the 9th, please make it a priority to attend the school). FiberTech Co., Ltd. kindly donated nylon gloves to NPO Little Creators for art workshops held in orphanages. They will be used in dye workshops and drawing workshops without using brushes. The works by children are up loaded in our Facebook every month. On behalf of children, we appreciate your support from the bottom of our heart. Thank you. ChildAid Asia's Alumnus will hold a charity concert "Bridge across the Sea". The children came up with this idea by themselves for the needy children. Please enjoy the concert and help the children! Little Creators Ltd. was set up on March 11, 2014 in Singapore. This sister organization is aiming at 1) promoting cultural exchange programmes in Aisa, especially between Japan and Singapore; and 2) job training and living support to the youth in Singapore by running a café. The café "Happy Pancakes" will open this coming summer on the 10th floor of the Orchard Central, which became possible because of a kind contributor form Japan. 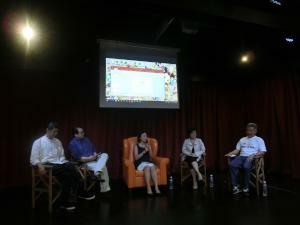 All proceeds of the café will be used for cultural exchange between children and youth in Asia. Moreover in August, a cultural exchange program is planned for the youth. We will report the activities by Little Creators Ltd. in Singapore from now on. Mr Shinjiro Koizumi, Parliamentary Secretary of the Cabinet Office and Parliamentary Secretary for Reconstruction, kindly sent a congratulatory cable message for children participated in "ChildAid Asia 2014." Congratulations on holding ChildAid Asia 2014 concert. I regret that I cannot participate today, but I hope that it is a great concert by the result of everyone's practices. It will be a precious asset in the future that children from various environments like Japan, Singapore and Asian countries are interacting through music and a performance for holding this event. Today, 10 months and 2 years have passed from the Great East Japan Earthquake. I expect that everyone including today's participants from Minamisoma in Fukushimas keeps their friendship. I am also hopeful for future success of your generation that forge the future of the disaster area, japan and the world. Prime Minister Shinzo Abe delivered a video message for the audience sharing his support for the cause and sending his best wishes for the concert. On January 11, 2014, "ChildAid Asia 2014" was held by 126 children form Japan, Singapore, Malaysia and Indonesia at the world famous music hall, Suntory Hall. It was an honor to have HIH Princess Akishino, graced the concert as well as to have more than 1600 people in the house. One of the unique features of this year's ChildAid Asia was collaborative performance. 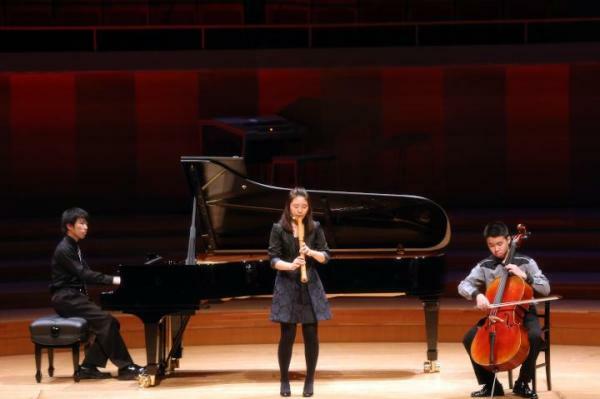 It was certainly a challenge, but all the performers seemed to enjoy instructing each other through music not only on stage but also off the stage. ChildAid Asia 2014 is not only the series of solo performances but there will be good collaboration works among children from 4 countries. The followings are a part of the program. NPO Little Creators has been asking for donation to support children who lost parents due to the earthquake and Tsunami as well as Child Nursing Homes in damaged area. Our Singaporean friends including those who supported our "ChildAid Asia in Tokyo 2011", American friends and Japanese friends sympathized and donated 495,716JYN in total by the end of June. Here we would like to show our deep appreciation to all who donated and considered this project. Thank you very much. As the first step, we wired the above mentioned amount to 'Iwate Learning Hope Fund' on July 14, 2011. 'Iwate Learning Hope Find' is the special fund Iwate Prefecture established, and it will keep supporting those children's 'living' and 'learning' till the time that they can support themselves. We hope those children in such tragic circumstance will go forward and live with a hope through this fund. NPO Little Creators continuously ask for donation to those children not only in Iwate but also in Fukushima and Miyagi Prefectures. Moreover, we are going to search what our organization can do by directly associating with them in the future. We are yet so powerless, so we shall appreciate for your support, advice and concern for coming days. Thank you. To donate money for those children, please use the following account.Your help change the life of those children who just lost a big support of parents. *Your donation will be send to the child nursing homes in through Community Chest (Kyodo Bokin). *We will report how and when your donation is sent to the children/the nursing homes. *This bank account is special for donation (different account from one NPO Little Creators use for its operation), and we do not take a penny from this account for our operation.